The Montclair Music Studio is proud to introduce Piano Instructor Christina Marcopolus, Montclair Music Faculty Member Since 2010. Christina is currently accepting students on Mondays & Tuesdays. Born in New Brunswick NJ, Christina is a Rutgers University graduate with a BA in both Music and Economics. Christina started playing the piano when she was ten and has over fifteen years of private training in classical piano, influenced by the works of Chopin, Beethoven, and Rachmaninov. During this time, Christina also experienced four years of private training in violin, with two years spent actively participating in local school orchestras. Christina has also assisted in various musical events throughout high school and colleges, such as volunteering for church music programs with which she had to coordinate large groups of children and adults. This included helping with the children’s choir, as well as playing the organ and helping to train the adult choir. 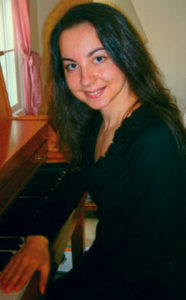 Having taught piano lessons to both children and adults since high school, Christina is comfortable teaching any age from Beginner through Advanced. For the most part, curricular rigor is chosen to fit the needs of each individual, depending on whether the student is preparing for the challenges of a conservatory, or simply learning for recreational needs. For Beginners, she often refers to both the Faber and Music Tree curriculum. Christina believes that a solid foundation in any instrument begins with Music Theory, something she incorporates little by little into each lesson. However, it is very important that the learning process be enjoyable, and she strives to make each lesson as fun, inspiring, and exciting as possible!